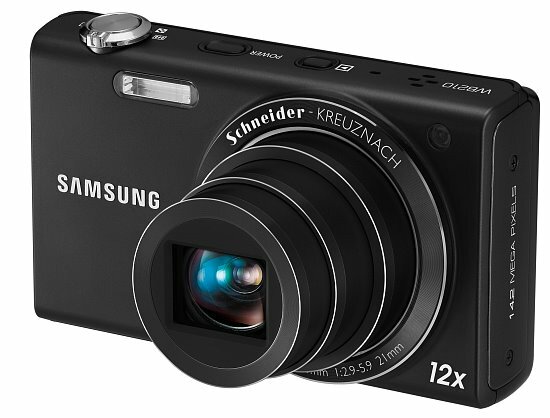 The more expensive model in a pair of compact, zoom-friendly cameras from Samsung is the just-announced WB210. Like it's cheaper by $80 sibling, the PL210, Samsung's WB210 features a 14.0 Megapixel 1/2.3" CCD image sensor, 720p (30 frames per second) HD movie recording, and a suite of filter and image processing technologies. Smart Filter 2.0 is mood-enhancement software with specially designed "looks" (soft focus, half tone dot, old movie, and enhanced movie) for both still images and movie recording. Smart Auto modes analyze key elements of your shots -- brightness, color, motion, etc. -- and adjust the camera settings automatically. But what, exactly, does one get along with an $80 surcharge? For starters, the WB210 is among the camera models to feature Samsung's brand new Smart Access UI (user interface) on its large 3.5" touchscreen LCD. Reverse engineered from Samsung's smartphone business, Smart Access UI is an intuitive, touch-screen-based interface which acts just like your favorite drag and tap phone "apps" icons. The Samsung WB210 also features an F4.0, 12x optial zoom lens covering a 35mm film equivalent of 24 - 288mm. Lastly, there is an optional Super Wide Shot mode which takes advantage of an optional, wide angle conversion lens unit (f = 3.5mm; 35mm film equivalent of 21mm) for large vistas and larger group shots from closer distances. The Samsung WB210 should be available in February with a MSRP of $279.99 US. There is also an optional 21mm wide-angle conversion lens; at this time, it's unclear whether or not it will be included at the time of purchase, or sold separately.